The United States Congress designated the Otis Pike Fire Island High Dune Wilderness (map) in 1980 and it now has a total of 1,380 acres. All of this wilderness is located in New York and is managed by the National Park Service. Just miles from New York City's skyscrapers, herons stalk through grassy wetlands and startled white-tailed deer leap over thickets of catbrier and the ubiquitous poison ivy in the Otis Pike Fire Island High Dune Wilderness. Fire Island, now protected as Fire Island National Seashore, shields Long Islanders from the raging Atlantic Ocean. This island attracts springtime rafts of migratory waterfowl bobbing on mainland-side waters and summer swimmers basking on the white beaches bordering the Atlantic. Fire Island traces a thin line along the coast. Orientated east-west, this barrier island stretches 32 miles long and ranges from 200 yards to one-half mile wide. A seven-mile stretch on the eastern half has been designated Wilderness. The Otis Pike Fire Island High Dune Wilderness extends from the Wilderness visitor center, west, to Watch Hill. It includes everything from the toe of the primary dune with its patches of seaside plants, and extends across areas of pine forest with hidden groves to the sheltered marshes along the Great South Bay. The Wilderness area does not include the ocean front beaches but provides for a remote and pristine experience. The area provides excellent backcountry camping opportunities and hiking along the trace of the old Burma Road, which ran the full length of what is now the Wilderness. Anglers cast for bluefish, striped bass, winter flounder, among other saltwater species, and scenic views and abundant wildlife attract bird watchers, wildlife viewers, and nature lovers, alike. 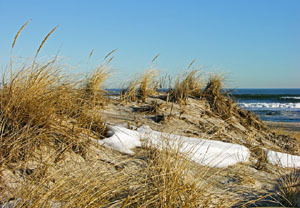 Planning to Visit the Otis Pike Fire Island High Dune Wilderness? How to follow the seven standard Leave No Trace principles differs in different parts of the country (desert vs. Rocky Mountains). Click on any of the principles listed below to learn more about how they apply in the Otis Pike Fire Island High Dune Wilderness.